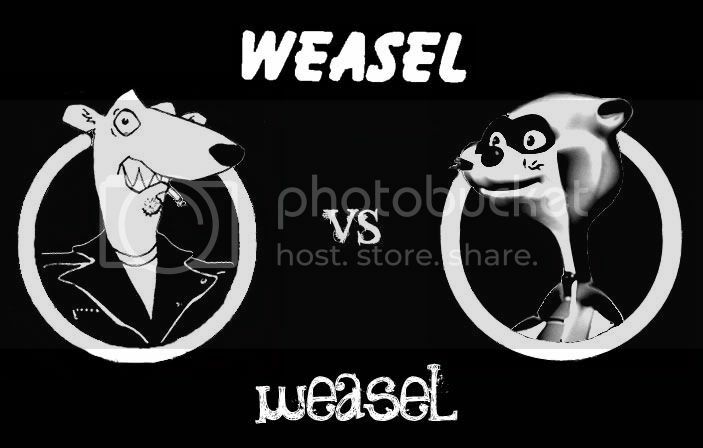 In this very special edition of Informant Inquisition we present “Weasel vs. Weasel”, an in-depth interview with Ben Weasel of Screeching Weasel (the original weasel). Ben and I recently caught up via email, since we were unable to sit down at New City Suburbs in Edmonton after their sold-out gig on December 11, 2009. My show review can be read in Renegade Rock Review Vol: 11. WestCoast Weasel: I opted out on a Christmas visit back to my hometown in Edmonton this year, to come a couple weeks early to see you guys play my favorite bar, New City Suburbs. I’m curious, why Edmonton, AB? Ben Weasel: New City made an offer and we needed a gig. Ben Weasel: It was terrific. I’d love to come back sometime – ideally in the summer next time. But the owners and staff at New City were fantastic and most of the fans were great. We all had a blast playing there. WestCoast Weasel: Is the plan to continue doing one-off shows for as long as it seems to work or is a tour in consideration? Ben Weasel: We’re not going to tour. We’ll keep doing one-offs for as long as people want to see us play. WestCoast Weasel: I understand the idea of writing/recording hasn’t been ruled out if the demand is there. How do you gauge such a demand and have any plans developed at this point? Ben Weasel: It’s hard to say. I just listen to what the fans say to gauge demand. If they want a record I’ll try to make it happen. I’m going to do some writing and demoing in March. I don’t have any plans beyond that for the songs. I’d love to do an album but the songs have to be great and we have to be able to have a reasonable recording budget. I don’t know if we’ll end up with an album’s worth of great songs and I don’t know if Recess or anybody else will be willing to give us the kind of budget we’ll need. I haven’t even thought much about a budget let alone discussed it with a label. WestCoast Weasel: If not, I imagine a live album / video of the classics would surely be successful. What are your thoughts on such a project? Ben Weasel: We might record some of the shows this year. Probably not video though. People always offer to do it and never follow through. It’s been that way for years. A video for our band doesn’t make a lot of sense anyway. The production values for our shows are pretty much zero. We don’t have our own sound man or lighting person. The only money you see on the stage is what the guys in the band are getting paid. Ben Weasel: It depends on the situation. I never liked Brian Johnson in AC/DC. I still refer to him as the new guy. But I never really cared much who was in Motorhead other than Lemmy. Brian Robertson was great on Another Perfect Day. I thought Richie was the best Ramones drummer. He was a great fit. I never saw the Ramones with CJ but he did a good job on the records. It all depends on how the new people fit in. Screeching Weasel had our share of people who didn’t fit in over the years, starting with our first lineup. WestCoast Weasel: Although it’s been widely documented as to why you no longer have a business partner ship with original member Jughead—was there ever any consideration for others previous guys such as Dan Panic or Dan Lumley? Ben Weasel: Panic lives in California and we haven’t talked in years. Nice guy but maintaining a working relationship with him was a chore. I like Lumley but he lives 5 hours away and has a day job. He’s a good guy and a really good drummer. I spoke with him about working with the Riverdales when we re-formed but the logistics were too difficult. He’d just gotten a new job and it probably wouldn’t have worked anyway, him living as far away as he does. WestCoast Weasel: Your entire catalogue was re-released within the last few years on Asian Man Records, but has very recently been pulled and moved over to Recess Records. Can you elaborate on the decision to make such a change and what fans can expect from the new business relationship? Ben Weasel: Mike Park’s a good guy and I wish him well, but it became the wrong situation for me and my bands. I was very uncomfortable working with the people he employs and there were a lot of business issues. A lot of things came to a head at once. Todd at Recess has been a fan for a long time. He seems willing to put money into the records and promote them properly. Mike told me from day one he wasn’t willing to do that. He was always up front about it. And that was okay for a few years. But with the bands getting back together, and the other issues, it was a no-brainer. It was time to move on. WestCoast Weasel: Despite not having any current releases (other than reissues, which are pirated nonetheless), what is your take on file sharing and/or YouTube bootlegging of the live shows? Ben Weasel: Illegal file-sharing hurts working bands. Hobby bands, and bands that are just starting out often say it helps them. I assume that’s true. But it hurts working bands. It doesn’t hurt big, bad labels. It doesn’t hurt the industry. It hurts the bands, and the bands it hurts the most are the ones that aren’t all over the radio and MTV. I’ve talked about this stuff ad nauseum for about 7 years now. When this started, file sharing proponents insisted that down the road this would benefit working bands. Nothing of the sort has happened. Quite the opposite, actually. It’s funny – file sharing proponents these days point to the success of bands who have gained an audience via Internet exposure as proof that file sharing benefits bands. If that’s true, why do all those bands, virtually without exception, sign with major labels as soon as they get that exposure? If file sharing is so good for them why don’t they keep giving their stuff away for free? Because it doesn’t work, that’s why. You can’t pay your bills when you give your music away. You can’t even pay for the recordings. It’s common sense. As for YouTube, I wish people wouldn’t put stuff up there but I don’t have the time or financial resources to get it taken down. My primary objection is that the quality is so poor. It’s really appalling. You can’t remotely get the feel for what our shows are like by watching a crappy video somebody in the crowd shot on their cell phone and posted on YouTube. The quality is so terrible that it makes us look bad. WestCoast Weasel: You’ve referred to periods of Screeching Weasel “when you drank.” Since I’m currently in the sobriety process myself I’m curious if this implies that you quit completely at some point or just not as heavy now that you’ve matured? Any insight or solidification of its importance or value to you would be intriguing. Ben Weasel: I never had a major problem with it but there were times early on when it negatively affected my performances so in 1991 I stopped drinking while I was working. By the mid-90s I’d grown out of the need to get drunk. I’ll have a drink or two every now and then but that’s it. I’m just not interested anymore. I get bored easily and being drunk is pretty much always the same. WestCoast Weasel: You’re now a father and I understand your children have been baptized. Has your stance on religion/faith changed over the years or was it the faith/myth side of “Science of Myth” that you leaned more towards even back when you wrote that song? Ben Weasel: Both, I think. I’ve been interested in religion as far back as I can remember. I’ve also always been looking for truth and what is genuine in the world. That’s exactly why I don’t have a lot of friends in punk. I’m not interested in social cliques or trying to be cool. I want something real, and most of what gets served up in punk rock is phonier than a three dollar bill. In 1991 I was much more of a “spiritual, but not religious” type of guy, even though I had no real spiritual life myself. I was never an atheist. Atheism seemed severe and joyless. But I didn’t believe anything in particular, and didn’t really think that much about religion. The song “Science of Myth” was written mainly to address the anti-religion cliches in punk at the time, but also because I was genuinely interested in religion. In the mid-nineties I started practicing meditation and reading about religion, especially Buddhism. Eventually I became a Buddhist, and several years after that I ended up in the Catholic Church. I don’t have time right now to go into the details of how and why. Like I said, I had always been interested in religion, and I’d always been searching for truth. WestCoast Weasel: Outside of the band are there any current solo projects or books that you’re working on? Ben Weasel: I’d like to have a six months off from everything to finish my writing. I started a novella in 2008 but I just can’t find time to finish it. I don’t see myself writing much of anything any time soon. WestCoast Weasel: Thank you for your time. We hope to see you in Vancouver sometime. It’s very appreciated.